Each builder of an owner-occupied modular, factory-built, condominium, duplex, townhouse, single family, and new home residences must register with New Home Warranty Program. A builder is known as an organization or individual within a business of constructing new homes. The Contractor Registration Act has a requirement that each contractor who engages in a business of selling or making home improvements will need to register each year with the Division. Municipalities can’t issue construction permits to a home improvement contractor who is unregistered, which was effective January 1st, 2006. Licensing can be issued at a county or city level. You must still register with the Division, even if you have licensure through the local town. You must register to be in the business of building new homes in New Jersey. You must also warrant each new home you build and provide warranty follow-up services. Registration is required do business as a home repair contractor. Plumbers, electricians and home improvement contractors are licensed in New Jersey. How to Obtain Registration Within the State of New Jersey. If the builder receives approval, a registration card will be issued. That card will need to be shown to local construction officials when the construction has a permit for a new home. Attach a $90 fee, which is non-refundable, to the division. Have proof of insurance for commercial general liability. Experience, Exam, Education, or Education Requirements: Are There Any to Obtain New Jersey Registration? No, there are not for the state level. It’s best to check with the city and county municipality for further requirements. Contractor Continued Education: Is This a Requirement for New Jersey? No, not when it comes to the state level. It’s best to check with the city and county municipality for further requirements. Annual renewal will be required for The Contractors Registration Act. 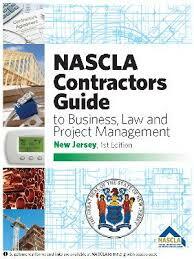 NASCLA Commercial Contractor License: Is This Accredited License Accepted Within New Jersey? General Contractor, Commercial Contractor: Is This License a Requirement in New Jersey? is crucial to register with the state. It is best to check with the city or county municipality for further requirements. Does New Jersey Have Reciprocity With Any Other States? Any out-of-state contractors who make or sell improvements to non-commercial properties or homes within the state of New Jersey will be required to register with the Division. It is best to check with local and county municipalities for further requirements. Question: How do I register my construction company in New Jersey? What forms do I need to register my new company in New Jersey? Question: How do I look up a company in New Jersey or see if a company name is available to register?